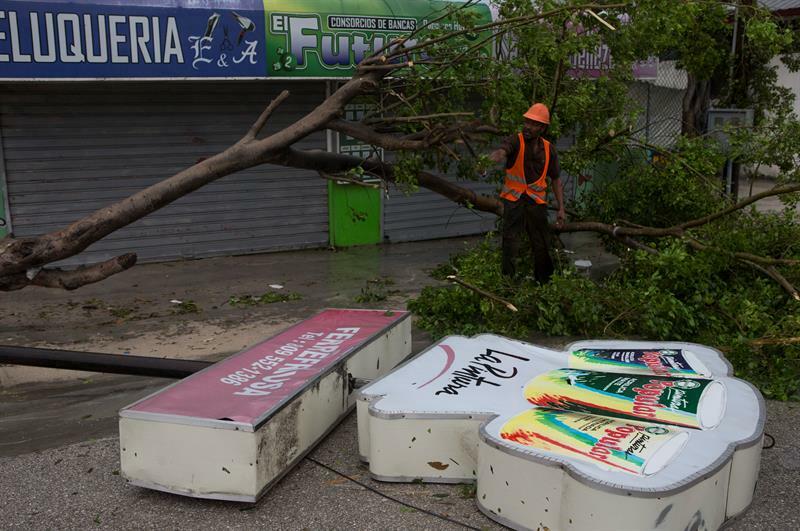 The hurricane Maria, category 3, left the Dominican Republic today after punishing the northeast coast of the country with hurricane winds, heavy rains and strong waves that have caused floods in several parts of the country. The eye of the hurricane, which approached the country about 100 kilometers northeast of the tourist resort of Punta Cana this morning, was located about 185 kilometers northeast of Puerto Plata at 1700 GMT after traveling along the northern coast. This hurricane, which has left at least one missing in the Dominican Republic, moves at an average of 15 kilometers per hour in a north-westerly direction, which gradually distances it from the island of Hispaniola to the archipelago of Turks and Caicos Islands and then to the east of Bahamas, the US National Hurricane Center (NHC) said Monday. As it passes through the northeast coast of the country, heavy rains and wind, with bursts that have exceeded 110 kilometers per hour, have caused the roofing of houses, the demolition of trees and electricity poles, which have left without electricity only in the north to more than 300,000 Dominicans. María has caused displacement of more than 14,000 people, affected 1,286 homes and 1 bridge, while keeping 15 localities incommunicado, according to the Emergency Operations Center (COE), which maintains 23 provinces in red alert (maximum), 4 in yellow (intermediate) and 5 in green (minimum). So far, the most intense rains have occurred in Punta Cana and other parts of the east, as well as in Samaná and Santiago, the second city of the country. In the town of Higuey, in the province of La Altagracia, the flooding of a river has flooded several streets in the neighborhood of Florida, Efe found. The forecast of abundant rainfall expected in the next few hours throughout the national territory worries authorities, due to the saturation of the soil after the rainfall caused by Hurricane Irma, which affected the country only two weeks ago without causing serious damage , and a subsequent trough, so they have insisted on asking for precaution to the population. It is estimated that the cyclone can generate accumulations of rainfall between 150 and 330 millimeters, being higher in isolated points, that could reach up to 500 millimeters, especially in the east, northeast, north and northwest. There will also be a “dangerous” cyclonic tide that, along with “large and destructive” waves, will raise sea level up to 1.2 to 1.8 meters in the hurricane alert zone in the country, from Cape Engaño to Punta Cana) to Puerto Plata, according to the National Hurricane Center (NHC). The hurricane also affected air traffic as several international airports suspended its operations for some hours and more than 70 flights were canceled from and to the two international airports in the capital. About 4,000 tourists who were staying in Bávaro and Samaná were transferred to other hotels in Punta Cana and the Dominican capital as a preventive measure of the tourism sector, the country’s main source of income. While in the main cities of the country the activity today was paralyzed since the government suspended work activity, both public and private, as well as classes in schools, and most businesses also closed their doors. Although Hurricane Maria is moving away from the north coast of the country, the National Meteorological Office (Onamet) still maintains the warning of hurricane conditions from Cabo Engaño, near Punta Cana, to Puerto Plata and a warning of storm conditions tropical from Puerto Plata to the Bay of Manzanillo as well as from Boca Chica to Cabo Engaño.